Cape Fear Formal Wear, Inc., located in Wilmington is our supplier. They offer a full line of tuxedos, men's suits, and accossories. Our Panache Special is a Classic Black, Traditional Peak Coat with white pleated shirt and black bow tie at $49.99. To include tuxedo shoes plus a vest and tie in a color to match bridesmaids gowns that cost is $79.99 (plus tax). Selections through Cape Fear include: After Six, Ralph Lauren, Raffinati, Claiborne, Neil Allyn, Geoffrey Beene, Perry Ellis and more... We offer a 20% discount off the standard price for all other tuxedo rentals. We maintain a small selection of new and vintage wedding gowns in stock for rent or sale; and we special order through Milano Formals Bridal Gowns, Bridesmaid's, Mother's Gowns, and Prom Gowns. We offer a 20% discount off the standard price for all orders through Milano Formals. We assist Brides with the selections, wording and other "savings tips" on initations and announcements as applicable to specific events. Ivy Lane Design offers a selection of elegant to down-home wedding supplies and gifts to cover all aspects of the celebration applicable to the entire wedding party! When you visit Panache, ask to see their catalog. We discount all prices shown in the catalog by 20% for our customers. To find additional Ivy Lane Designs, visit www.ivylanedesign.com. 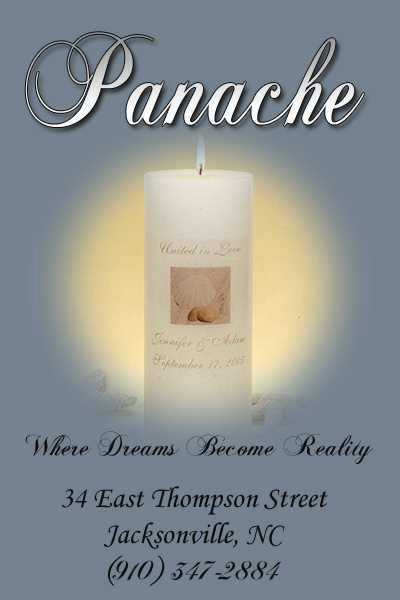 Be sure to place your order through Panache to receive your discount.